Read different of translations of the bible in parallel. Our mission is to show how the Bible is a unified story that leads to Jesus. Our church has been able to read through the The Bible with the help of The Bible Project's short introductory videos. Through the theme videos, we've been able to communicate big ideas that run through the entirety of Scripture in a concise, easily-digested manner. Unlike other versions of the New Testament, this translation uses as many English words as are necessary to bring out the richness, force, and clarity of the Greek Text. Intended as a companion to, or commentary on, the standard translations, Wuest's "expanded translation" follows the Greek word order and especially reflects emphases and contrasts indicated by the original text..
Kenneth Samuel Wuest (1893–1962), a noted New Testament Greek scholar of the mid-twentieth century, was a beloved professor of New Testament Greek at the Moody Bible Institute in Chicago and published over a dozen books on the New Testament. 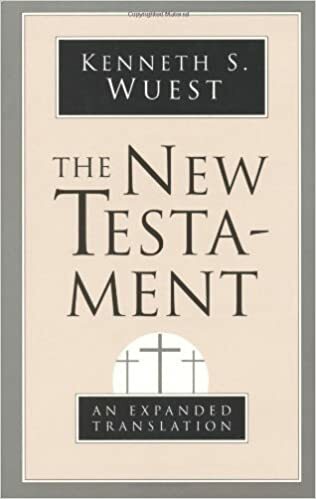 His Expanded Translation of the New Testament is treasured by those who appreciate the nuances of the Hellenistic Greek language (or Koine Greek), a language which its author knew and loved so well.